Carl Willey was born on Saturday, June 6, 1931, in Cherryfield, Maine. 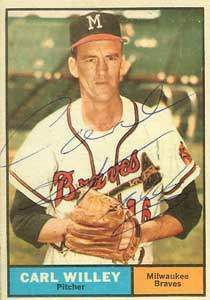 Willey was 26 years old when he broke into the big leagues on April 30, 1958, with the Milwaukee Braves. His biographical data, year-by-year hitting stats, fielding stats, pitching stats (where applicable), career totals, uniform numbers, salary data and miscellaneous items-of-interest are presented by Baseball Almanac on this comprehensive Carl Willey baseball stats page. Carlton Francis Willey was a Major League Baseball player who pitched for the Milwaukee Braves (1958-1962) and New York Mets (1963-1965). When Carl, his nickname, stepped on the mound in County Stadium, on April 11, 1963 (versus his previous employer, the Milwaukee Braves ), he became the first Mets ' player to ever wear #11 in a regular season game! "A small sleepy potato farming town in northern Maine near the Canadian border called Cherryfield-the sort of place that was inhabited exclusively by lobster fisherman and grizzly bears. Over the main street of the town-which coincidently was the only street in the town there was a guge white muslin banner strung between the Flying A Gas Station sign and the front of the McKeither Brothers Dry Goods Store that proclaimed in faded red script: WELCOME TO CHERRYFIELD, MAINE HOME OF MAJOR LEAGUE PITCHER CARLTON WILEY. I can't help thinking that nothing he could do, no matter how dismal or mediocre could ever prove disappointing, in any way, shape, or form, to the people of Cherryfield, Maine."